Compression stockings are usually the first option in managing varicose veins. They are much less expensive than other options and they are a non-invasive treatment for relieving the pain and heaviness often felt with this condition. In many cases, compression stockings are recommended for patients who have just undergone one of the various vein treatments available at clinics across the country. They not only promote healthy blood flow, but are also used to aid in healing after these procedures. These stockings are intended to reduce the pooling of blood found with varicose veins and spider veins. Pressure is applied tightest around the lower leg, with less pressure applied as the stockings go up the leg. This helps to milk blood up the leg and towards the heart. These stockings will not cure varicose veins, although they are effective in relieving symptoms caused by the condition and may reduce the risk of blood clots. Compression stockings may be purchased with or without a prescription. Non-prescription compression stockings may be successful in relieving the symptoms of varicose veins, although prescription stockings are usually tighter and more effective. The doctor may give you the stockings directly, or may write a prescription for compression stockings so you can purchase them at a medical supply store. There are a variety of strengths, styles and colors that you have to choose from. You should go with stockings that you feel comfortable wearing and you should keep in mind that they should be worn all day long. The stockings should provide support and should be strong, but they should not be unbearably tight. Consult a vein specialist for more information on choosing stockings that are right for you. You should put your stockings on upon waking up before even getting out of bed. They can be taken off at night before going to bed, although you should try to keep legs elevated while not wearing stockings. You may be required to wear compression stockings for life, or for a certain length of time/until the condition improves. Name brand compression stockings may cost more than other brands, although most prescription compression stockings are very effective in providing relief. Compression stockings usually cost between $30 and $50, although some may cost even more. Each pair typically lasts for six months to a year, although this may vary. Hand washing them may help to maintain their elasticity and thus their service life. Before wearing compression stockings, you should determine if you're a good candidate to wear them. Talk to your doctor for specifics, but generally speaking, diabetics, individuals who smoke and those with a decreased blood supply in the legs are not considered good candidates and should not wear compression stockings. As always, those suffering from varicose veins should consult with a vein specialist regarding their treatment options. 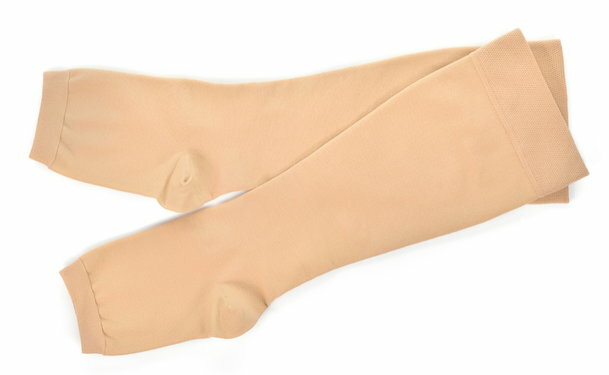 Compression Stockings or Socks — What's the Difference?